The Little Bookworms fell in love with this book as soon as they saw the moving eyes on the front cover. The moving eyes and incredible fold-out spread featuring the “Panda-monium ball”, make Fred’s adventures across the city truly captivating. The stunning illustrations, which include so many clever panda references, made it a real challenge to decide which pages to photograph. The Little Bookworms were eager to share what they had spotted on each page, and were particularly eager to discover clues about Fred’s whereabouts. If only Stanley was as quick as the Little Bookworms, he might have found Fred sooner. Yesterday, one of the Little Bookworms brought this fabulous book into school for World Book Day. The book was accompanied by a bag full of (plastic) sea creatures, and she waited very patiently to share her book today. The Little Bookworms loved listening to the rhymes about a range of sea creatures. There were creatures who live in shallow water, at the bottom of the ocean, and animals that live out of the water, including sea turtles. The Little Bookworms learnt some fantastic facts about the creatures, and giggled at the thought of being tickled by an octopus… Imagine being tickled by 8 arms at once! Some of the Little Bookworms were keen to get close to a shark’s jaw and see the rows of razor-sharp teeth – I’m not so keen. Happy World Book Day! I hardly recognised the The Little Bookworms when they walked into the classroom this morning in their wonderful costumes, inspired by their favourite books. It was the perfect time for me to share a fantastic, newly discovered book. The Little Bookworms were intrigued to read a book that had ventured all the way from the States. They were engrossed in the story from the moment the gorillas crept out of the zoo, in the middle of the night. There were some fantastic predictions about where the gorillas would go… Maybe the Little Bookworms could write a sequel! After swinging on chandeliers in an upmarket clothes shop, the gorillas’ rumbling tummies lead them to an ice cream shop with scrumptious flavours, including banana supreme – perfect for a gorilla! Next, the gorillas spot an empty gymnasium, and filled with energy, they have great fun in bouncing on the floors, jumping in the foam pits and swinging from hoops! Suddenly, a caretaker puts a stop to their fun. Luckily, the gorillas outrun the caretaker and make it back just in time. After a thrilling adventure, it’s no wonder that the gorillas are snoring away the next day! I wonder whether animals in the UK have such exciting adventures. Straight away, the Little Bookworms guessed how Tin got his name! Despite guessing the explanation behind his name, they didn’t expect what was to come, when Tin has the important job of looking after his little sister, Nickel. Before Tin can even say her name, she has disappeared up a tree, and just in case that isn’t bad enough, she grabs hold of a balloon and floats away! Tin and Nickel end up in an enormous city, before unexpectedly landing on safari animals parading the streets, and finishing up by going separate ways at a safari park. What an adventure! Will Nickel and Tin make it home before their mum returns? Will Tin ever be trusted to look after Nickel again? After exploring Cambridge on Thursday, the Little Bookworms loved going on an adventure through London with Katie and Jack. From the moment I opened the book, the Little Bookworms were eager to name the different sights of London. When Grandma fell asleep in Trafalgar Square, the Little Bookworms had no idea what was to come! 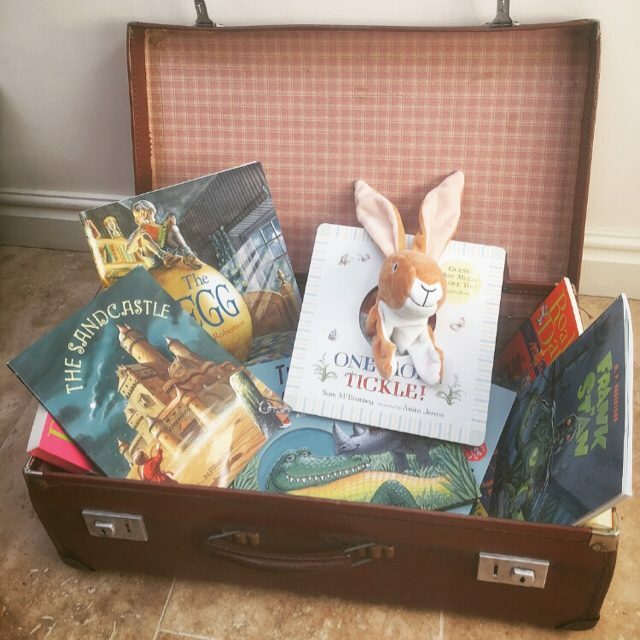 The Little Bookworms absolutely loved the idea of travelling around London on one of the big bronze lions and wished they could have a magical tour like that, maybe even around Cambridge! After seeing the sights of London and many puzzled faces, Katie and Jack buy a present for the lion – a blanket to keep his tummy warm when he lies on the cold stone! What a wonderful way to say thank you for such a fantastic tour of London. Will Grandma find out about Katie and Jack’s adventure? Will Katie and Jack return to London for a second adventure? After discovering a live dinosaur, Sir Charlie Stinky Socks and his companions head for Thunder Mountain to take the dinosaur home. The brave adventurers find themselves in a less than ideal situation when they clamber up a volcano that could erupt at any moment. As if this isn’t scary enough, the volcano begins to tremble… It’s a dinosaur! Can Sir Charlie and his friends help the dinosaur to get home safely? Can they escape from the other stampeding dinosaurs? Will Charlie’s stinky socks save the day? I wonder whether the Little Bookworms will be keeping their eyes peeled for dinosaur eggs at the Sedgwick Museum tomorrow. One of the Little Bookworms is a huge Ghostbusters fan and just couldn’t wait to share his new library book with the rest of the Little Bookworms. “Ghost in the House” was an interesting book to read in 17 degree heat with sunlight pouring through the window of our classroom. Nevertheless, the Little Bookworms were hooked from the first “BOO!”. The story begins with a ghost who appears to be alone and wandering nervously around the house. The ghost is joined by a friendly mummy, then a monster, and new creatures are discovered around each corner. Suddenly, the scariest creature of all appears… A boy! The creatures sprint away from the house, just as the little boy wishes them goodnight. The Little Bookworms were surprised to discover that the creatures were so scared of the little boy, especially since a few of the Little Bookworms were initially a little scared of the creatures in the book. As well as counting along with the creatures, the Little Bookworms loved spotting the rhymes and adjectives throughout the book. They even thought of alternative adjectives to describe the characters. The Little Bookworms were very excited for a story together after a week off school, and this book was no disappointment! The Lost Nuts of Legend sounded like a dream for the Little Bookworms. Being invincible, immortal and it never being past their bedtime… The Little Bookworms couldn’t think of anything better and wished they had found the nuts. All seems to be going well until the Star Nav breaks, the crew encounter some unfriendly neighbours, then they are faced with a dilemma when it comes to the Death Banana. Despite the warnings, the Little Bookworms were confident that going to an “evil empire” was a good idea… I wasn’t quite so convinced. Will the triumphant crew ever make it home? Will the nuts be brought back in one piece? The Little Bookworms were very concerned after reading the first page of this book… Some poor toys had been accidentally left outside overnight. The Little Bookworms couldn’t imagine how lonely those toys must have been. As the toys gaze up at the stars, one of the stars gets bigger and bigger. The toys realise that the growing star is in fact a spaceship. The Little Bookworms had great predictions about the inhabitants of the spaceship, including an alien octopus, which turned out to be very accurate. Before the toys know it, they are being beamed up into the spaceship, where they encounter Hoctopize. Hoctopize is distraught as he has lost his favourite toy, Cuddles. In an attempt to find his toy, he has picked up thousands of abandoned toys from gardens, yet he still cannot find Cuddles. Can the newly arrived toys help to return the other toys to their owners? Will they find Cuddles? Will they return to Earth before morning?